any single-slot PXI 3U module. They can be plugged directly into any PXI or CompactPCI crate. 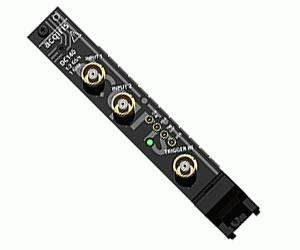 Top of the line is the DC140, which offers a sampling rate of 1 GS/s on each channel, wide 1 GHz bandwidth and long 128 kpoint/channel acquisition memory (optional 8 Mpoints) and up to 2 GS/s and 256 kpoints of acquisition memory (optional 16 Mpoints) in single-channel mode. As a cost effective solution, the DC135 uses the same SiGe technology and overall architecture as the DC140. It has dual-channel sampling rates of up to 500 MS/s (1 GS/s in single-channel mode), 500 MHz bandwidth and 64 kpoints/channel of memory (optional 2 Mpoints). respectively. Moreover, the cards’ long acquisition memories (up to 16 Mpoints) enable them to record complex signals over long periods of time. of each channel at the same time. The independent SiGe front-end circuitry ensures that timing skew (between channels) is kept to a ± 100 ps typical.